PHOENIX - Domonic Brown did not attempt to pull a J.P. Howell slider aimed for the outer part of the plate. He stayed back, lowered his black bat to meet the 79-m.p.h. pitch, and drove it to the opposite field. This was last Tuesday, when Brown smashed his most important hit of the Phillies' 10-game road trip, a go-ahead double in the 10th inning at Dodger Stadium. The ball landed in left field, emblematic of an April trend and the challenges Brown now combats. Through 25 games, Brown has a lower slugging percentage (.330) than slap-hitting centerfielder Ben Revere (.333). He ranked 55th among 70 qualified outfielders in slugging percentage entering Monday's play. Brown emerged in 2013 when he was an all-star selection and crushed 27 homers. His .494 slugging percentage was eighth among all outfielders. The opposition, naturally, adjusted its approach. Brown, in turn, still is tinkering with his power stroke. "It all depends with me, really," Brown said. "I've always been a guy who could hit one or two in a month and then hit nine or 10 in a month. It's all different for me." Brown said different teams have adopted different approaches. The Dodgers, he said, were one of the more passive teams. Howell, a lefthanded reliever, started Brown with a sinker down the middle for a called strike. He threw an outside slider that Brown watched. He hit the next slider, in the strike zone, to the wall, splitting the leftfielder and centerfielder. But Arizona, Brown said, mixed more inside pitches. He had four singles in the three-game series. Three were hit to the right side. Just five of Brown's 24 hits this season were pulled to right. All three of his doubles were hit to the opposite field. His lone home run landed in the right-center stands at Citizens Bank Park when Atlanta lefthander Luis Avilan threw Brown an inside 1-0 fastball on April 14. 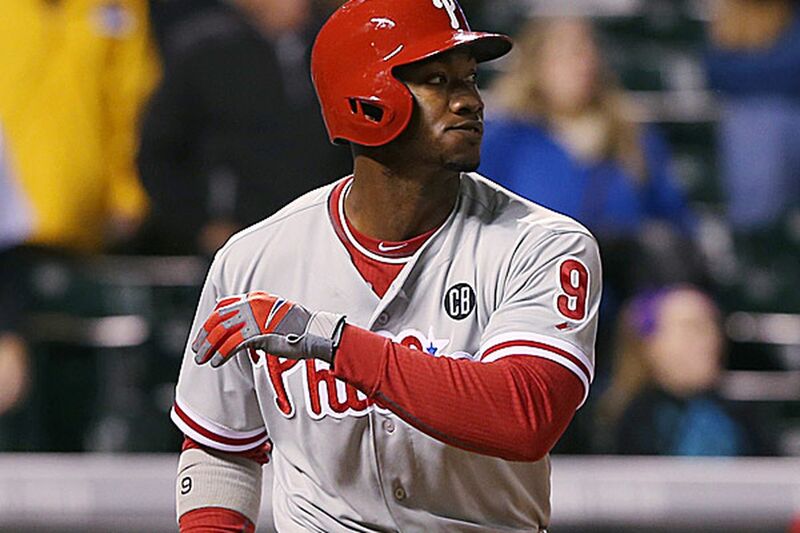 "He's taking what they're giving him," Phillies general manager Ruben Amaro Jr. said. "I think he's handled himself fine. He's had some balls that could have been up the middle and went off the pitcher. He could have a lot more hits than he has right now. He's not hitting for as much power right now than he did last year, but that comes and goes." That point is salient. Brown ended last April with a .372 slugging percentage fueled by three doubles and three homers. He exploded in May for 12 homers in 109 at-bats and followed with six more bombs in June. Amaro said Brown can drive the ball the other way if pitchers continue to pelt him away, although only one of Brown's 27 homers last season was hit to the opposite field. "I'm more concerned about those guys producing than hitting home runs," Amaro said. "If they're getting on base and producing runs, then great. Obviously, you'd love to have a guy hit home runs. But you have to take what you get." Brown agreed. He believes that more hits to the opposite field could change pitchers' thinking yet again. It starts with Brown's maintaining a relaxed plate presence. "I've hit a lot of balls that were away and pulled them," Brown said. "It all depends. If I'm ahead in the count, I can still get to that ball and hit it out to the middle of the field. It all depends. It's baseball." Carlos Ruiz was named the National League's player of the week. He batted .500 (11 for 22) with a .593 on-base percentage and .909 slugging percentage. . . . Cole Hamels will make his home debut Tuesday against New York. He posted a 4.94 ERA in five starts against the Mets last season.